Rectangular acreage; over 140 acres – Ideal for development. Located between Austin-Bergstrom International Airport and Circuit of the Americas. Another great property for sale in Austin, Texas. Awesome 2 acre lot overlooking Lake Travis with panoramic hill country views. This beautiful lot is surrounded by multi million-dollars homes, in a great neighborhood right off of Lake Travis. Imagine building your dream home by the lake! Located roughly 20 minutes from downtown and 5 from shops and restaurants. Marshall Ford Marina and Tom Hugh Park around the corner, and just minutes away from the popular Oasis On Lake Travis. Another great property for sale in Austin, Texas. Beautiful former model home from Ashton Woods Homes near Bee Cave. Enjoy decorator details, impeccable layout & location in this gated, community-owned property. Wide plank wood floors throughout 1st floor, farm sink, pot filler, HUGE kitchen island w/storage & seating. Storage closets galore. Spacious master on main w/double vanity, garden tub, separate shower, & two walk in closets. Covered patio plumbing for future outdoor kitchen. High ceilings, great natural light & plenty of space for the whole family! Great 1.77% TAX rate. Conveniently located close to Hill Country Galleria, and feeds into top-rated EANES ISD. Another great home for sale in Austin, Texas. BEST PRICE AND ONLY HOUSE FOR SALE IN UPLANDS! Nestled within the beautiful Uplands gated community * Gorgeous custom stone home w/ sparkling in-ground heated pool & spa on huge lot loaded w/ trees & lush landscape * Sprinkler system * Bright & open floorplan * Many windows * Sports court * New carpet & stove cooktop * Recent Fresh paint * Large island kitchen w/ Granite countertops * Private Master Suite w/ Flex room * Flagstone Front Steps * Three A/C units * Raised ceilings * Builtin desk * Corner fireplace * Three car garage * Huge gameroom * Separate garden tub & walkin shower and much more * Lake Travis schools. One of the largest homes on the largest lot in Uplands! Uplands is an exclusive Southwest Austin gated neighborhood and a master-planned community known for large lots offering Hill Country views and privacy. Uplands homes are located in the Austin MLS in area LS and the 78738 ZIP code and borders the 4,000+/- acre Barton Creek Habitat Preserve. The Uplands neighborhood started developing in 1996 and was completed in 2005. Uplands homes are located near great shopping and entertainment including the Hill Country Galleria shopping center which includes a Starbucks, large HEB and Whole Foods Market grocery store. It also includes Austin’s Voted Best ice cream, Amy’s Ice Cream, and several great restaurants like Gumbo’s, Riviera Bistro, Maudie’s Tex-Mex, Buenos Aires Cafe, Mandola’s Italian, and Iron Cactus. Uplands neighborhood offers easy access to both Highway 71 and Bee Cave Road. Uplands is within the Lake Travis Independent School District. Schools serving the neighborhood include Lake Pointe Elementary School, Lake Travis Middle School, and Lake Travis High School. The city of Bee Cave is less than 20 miles west of Austin, Texas in Travis County. Seated on the edge of Texas Hill Country, Bee Cave is a small city next to Austin and is considered one of the most popular areas to reside if you are wanting scenic panoramic views, luxury upscale homes all in a rural setting. Bee Cave is located where Highway 71, Ranch Road 620 and FM 2244 converge which is just past Lakeway and Lake Travis. Though it’s considered to be in a rural area, it is still very convenient to Downtown Austin and Austin-Bergstrom International Airport. It is also close to the well known Hamilton Pool Preserve. Homes in Bee Cave are around 3600 square feet on average and range from older ranch-style homes to new custom built homes with acreage. The city of Bee Cave offers Hill Country lifestyle with conveniences of larger city life. Another Great Home Sold by Premiere Team Real Estate – Newly remodeled 3 bed/2.5 bath single story home in highly sought after Courtyard neighborhood in west Austin. This beautiful home on a corner/cul de sac lot features tons of upgrades, including unique art additions by the previous. owner, in a spacious & open floor plan. The family room features a stone fire place w/built in shelves on each side, a copper accent wall, vaulted ceiling, and hardwood floors. The kitchen features granite counters, breakfast bar, pass through window to dining, and stainless steel appliances. The master suite is on the main floor and includes a full bath w/double vanity, tiled walk in shower, and patio access. The private backyard is a paradise w/large trees, lush landscaping, heated lap pool, sprinkler system, & outdoor movie setup! Neighborhood includes residents only park & playscape, Bull Creek/Lake Austin access w/boat & kayak storage, Pool & Tennis Club, & more! This home is truly a must see! Another great home for sale in Austin, Texas. Don’t miss this updated ranch style home with a pool. Hardwood floors, gourmet kitchen, granite counters, and custom cabinets. Large windows make this home light and bright. Large 0.3 of an acre lot with mature landscaping and many trees that give this yard a garden like feel. The owners have meticulously cared for the home and have replaced almost every component. If you are looking for move in ready this is it! Quiet street with great walking, hiking and biking in the neighborhood and green space. Another great home for sale in Austin, Texas. Beautiful 3 Bed/2.5 Bath townhouse in highly desired Mueller community. Outstanding open floor plan w/10′ ceilings & lots of natural light. Features include upgraded finishes & fixtures, ceramic tile, recessed lighting, plus 6.5 KW Solar System. The center island kitchen opens to the living area, while the breakfast bar overlooks the dining area, and features Silestone Counters & Energy Star Stainless Steel Appliances. The master suite is on the main floor, and features a spa-like bathroom w/jetted tub & separate walk in shower, walk in closet, and access to the private courtyard. The second floor features a second living area, and spacious bedrooms w/a double vanity in the guest bath. Mueller Amenities include 2 pools, parks, playgrounds, dog park, protected bike lanes, walking trails, & more! Conveniently located! Walk to lots of shopping, dining, & entertainment like the Alamo Drafthouse. Another great home for sale in Mueller, Austin, Texas. Another Great Home Sold by Michael Van of Premiere Team Real Estate – Beautifully upgraded home w/excellent hill country views. Features include gorgeous hand-scraped hardwood floors, crown molding, window treatments, & open kitchen w/huge island, granite counters & stainless appliances. The spacious open plan features large windows & gas log fireplace in the family room, with the master suite, formal dining, & study downstairs. The second floor features a large game room, media room & spacious secondary bedrooms. The large backyard features a covered patio w/beautiful hill country views. Upgrades include wiring for surround sound and Tech Shield under shingles for energy efficiency. Conveniently located close to Hill Country Galleria & Bee Cave Central Park. Another great home for sale in Bee Cave, Texas. Another Great Home Sold by Premiere Team Real Estate – Gorgeous, spacious home in classic Circle C Ranch. Great floor plan, master down. Bathrooms newly remolded. Coffered ceilings with crown molding throughout. Features include recessed lighting, built-in gas range and oven, wet bar, plantation shutters, and bonus room/office. Detached garage -wonderful outdoor living area with hot tub on a beautiful corner lot, nestled on a Cul-De-Sac. Another great home for sale in Circle C Ranch, Austin, Texas. Another Home Sold by Premiere Team Real Estate – 3 bedroom and 2.5 bath home with beautiful views and large deck. List of repairs and upgrades completed to structure and functioning features of home. Owners pride and immaculate care is evident; from the exterior landscaping to internal condition all aspects of the home. 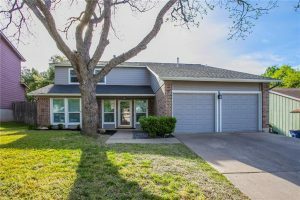 Well maintained 2 story home in great north Austin neighborhood. Spacious floor plan feat. high ceilings, formal living & dining, & master on main w/full bath, double vanity, & 2 closets. Family room w/stone fireplace, built-in shelves, & wet bar w/hidden closet behind wine rack. Huge backyard w/gazebo, extended patio, & trees. Updates incl. recent HVAC, new exterior siding & trim, & new front bay windows. Conveniently located close to schools, parks, The Domain, & more! Another great home for sale in Austin, Texas. Another great home sold by Premiere Team Real Estate – Recently remodeled 3 Bed/2 Bath home for sale in South Austin, Texas*Updates include fresh interior paint, wood laminate floors, ceramic tile, carpet & more*Stainless steel appliances*Breakfast bar*Raised ceilings*In-Law plan*Recessed lighting*Open kitchen overlooks family room w/stone wood-burning fireplace*Office/Study*New water heater*Lg Master suite has walk-in shower, garden tub, walk-in closet & 2 sinks*Private backyard*Huge covered patio*Sparkling heated in-ground pool*Close to schools, grocery store, restaurants*Conveniently located near Airport, Downtown and U.T*Taxes were estimated*Another great home for sale in Sunridge Park, Austin, Texas.